The backlash continues to grow against the urban farming trend when it comes to backyard flocks. In recent years, cities across the US have revised land use codes to permit backyard flocks. But now those same cities are seeing an increase in neighbor complaints, dumped and surrendered chickens and even rat infestations. It’s a complex issue with emotional and political implications including social justice, personal freedom and self-sufficiency. But animal shelters and rescue groups will tell you it’s just gotten out of hand. 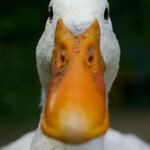 I have been rescuing and rehabilitating ducks and clucks for over nine years now. There hasn’t been a single day in that time when I am not at or beyond capacity. I don’t know of any reputable, safe sanctuary in the entire NW that isn’t also at capacity and constantly seeking safe homes for dumped poultry. Not one. It’s becoming a crisis and the animals are suffering. You know what’s missing from those professionally-photographed and beautifully-styled yuppy urban farms? A LOT. A WHOLE LOT. 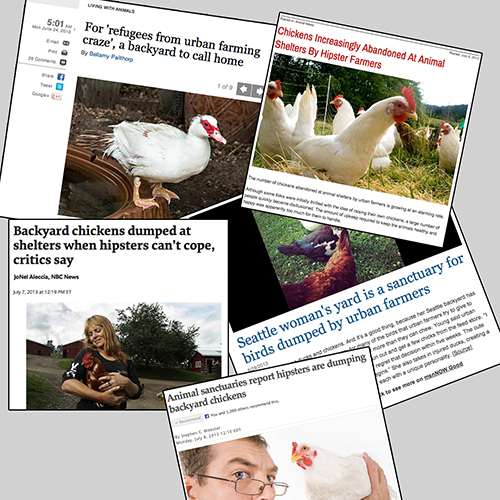 Here’s our collage of the reality of many backyard flocks. This is just a few snapshots of what happens every day with backyard flocks. Not quite as romantic and beautiful as the Williams Sonoma catalog, is it? 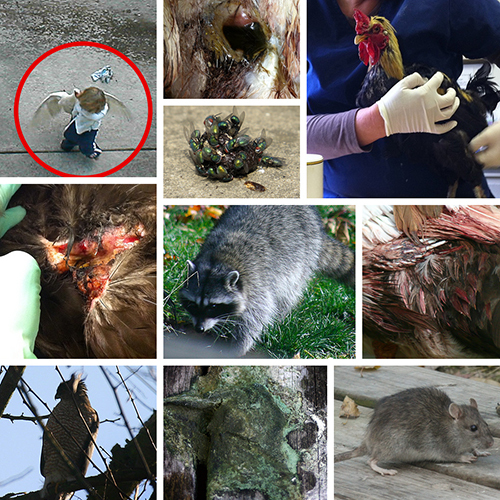 This collage includes aggressive ducks or roosters that bite children, infected wounds from dumped geese attacked by dogs, chicken $#!t covered in flies, an injured rescued rooster covered in lice, a raccoon bite down to the vertebrae, raccoons, bloody wing from raccoon attack, hawks, $#!t-covered deck and porch, and rats… lots of rats. So obviously we discourage backyard flocks. You don’t rescue over 100 birds in 9 years and come out thinking backyard flocks are an awesome idea. This isn’t to say that everyone is doing it wrong. But enough people are regretting their choice to get flocks that it’s causing a big problem for shelters and sanctuaries, and way too much unnecessary suffering for the animals caught in the middle. So here’s our list of tips to seriously consider before ever taking on the commitment of a backyard flock. But honestly? Just don’t do it. Tip #1: Protecting urban chickens is costly but required. Chicken wire is not predator proof. Hens are extremely vulnerable to predators like hawks, eagles, raccoons and dogs. Raccoons can reach right through chicken wire to eat hens through the wire, and often work in groups. Eagles and hawks don’t pick up hens and fly away with them, they just take a piece. 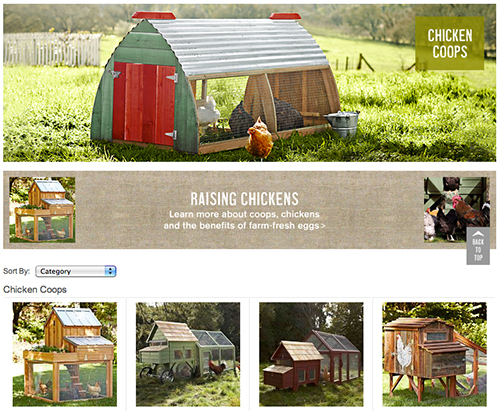 Roomy coops with hardware cloth on all sides, top and bottom can provide safety for urban hens. Tip #3: Hens get sick. What will you do? When a hen is sick, do you know where to go for urgent treatment? It is important to ensure that even backyard hens are free from suffering and neglect. Basic veterinary care for infections, parasites or injuries can start at $80 and run into the hundreds of dollars. Birds are much better than dogs or cats at hiding illness, so it is critical to get them care quickly. Are you prepared to ensure your birds don’t suffer? Tip #4: Chicken feed attracts rats and chicken droppings attract flies. Cleaning and maintaining urban coops on smaller lots can be difficult and time consuming. Flies and rats bring parasites and illnesses with them that can infect hens and other household pets. Rat populations can easily get out of control and often damage homes. Tip #5: Hens don’t lay eggs every day. Many urban farmers get hens to ensure their families have humanely-raised, fresh eggs to eat. But hens have natural cycles that change as the seasons change, and sometimes they don’t lay eggs. Laying an egg every day takes a lot of nutrients, especially calcium. Poor nutrition or poor breeding can cause many hens to be prone to reproductive cancers and other maladies like prolapse and egg binding. First-time farmers often need to be reminded that hens are not egg-laying machines and each hen is an individual. Egg-laying hens reach their peak at 18-months but can live more than 10-years. Tip #6: Hens crow too. While generally not as loud as roosters, hens crow too. Hens cluck in the morning quite early to be let out of their predator-proof nesting areas. In the summer when days are long, the hen crows can begin at 4:15am. Neighbors will tend to think you are illegally keeping roosters if they hear crowing, and may complain. Also, some hens cluck loudly when they lay eggs. It is important to keep in mind if you have close neighbors. Tip #7: Each hen has a unique personality. While some breeds have specific characteristics, every hen is her own chicken. While they can be charismatic, emotional and interactive, some hens will attack and injure less dominant hens, especially if space or food is limited. Other hens will eat their own eggs. Some will chase other household pets or pluck out their own feathers. They are unique individuals and don’t always get along. In summary, because hens are easy to hatch and cheap to buy, they are often treated as disposable animals. And hens that no longer lay eggs are considered useless. But when it comes to suffering, all animals are created equal. With proper care and attention, hens can live up to 10+ years. Before becoming responsible for the care and happiness of any living being, do all the research you can, and be wary of anyone who makes urban chicken coops seem simple and easy. It is a years-long commitment with daily, required care. P.S. If you still still STILL think a backyard flock is for you, ADOPT! Please adopt. Do not buy or hatch while so many healthy, beautiful, loving, friendly birds languish in shelters.